Optimizing your exercise routine is essential if you want to improve the muscle tone in your thighs in two weeks. This means incorporating leg exercises and training techniques that recruit the most muscle tissue. Circuit training on three days of the week and High-Intensity Intervals on two days can optimize your results. Even then, it's essential to understand that everyone's body responds differently to exercise. Also, if you have excess fat covering your thighs, you won't see results until you reduce the fat, which is safest when done gradually at a rate of no more than two pounds per week. Include lunge varieties in your workout. Lunges optimize results by working the front, back, inner and outer part of your thighs in addition to your glutes and calves. To do basic lunges, step about 2 feet forward with your right foot while keeping your torso upright. Then bend both knees and lower your hips until your front thigh is parallel to the floor. Push off with your right foot and return to the starting position. Repeat the lunge with your left leg and work your way up to finishing three sets of eight to 12 repetitions. Other lunges you can do include walking lunges, reverse lunges, lateral lunges, and curtsy lunges. Perform step-ups as part of your thigh-toning regimen. Stand in front of a bench and step onto it with your right foot. Push though your foot to squat up and bring your left foot to meet your right on top of the platform. Then step down with your right foot, followed by your left foot. Do three sets of eight to 12 repetitions. 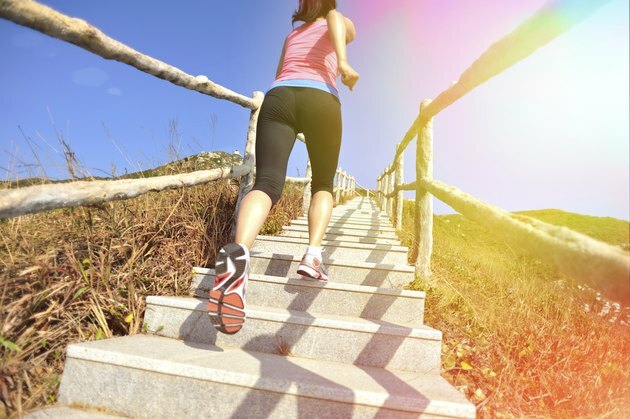 As an alternative, use the bottom steps of a staircase if you don't have a bench. Add squat varieties to your routine. Wall squats, for instance, are safe for your back and ideal to learn proper squat form. Stand with your back against a wall or place a stability ball between your back and the wall. Step your feet about 1 foot forward, and then slowly lower your hips as if you're sitting down on a chair. When your thighs are parallel to the floor, slowly push through your feet to return to the starting point. Finish three sets of eight to 12 repetitions. Other squat varieties you can include are front and back squats or one-legged squats. Incorporate circuit training on three non-consecutive days of each week. According to the American Council on Exercise, circuit training optimizes your results, because it burns calories and stimulates muscle tissue; your body fat reduces and your muscles get toned. Set up at least six exercise stations and perform 15 repetitions of each exercise with 15 to 30 seconds of rest in between. Perform just strength-training exercises or combine strength training with cardio. For instance, do lunges, followed by chest presses. Then do jumping jacks and squats, followed by dumbbell curls and pushups. Emphasize your leg muscles as much as you desire, but also include other major muscle groups, especially if you have excess fat to burn. Perform high-intensity interval training on at least two non-consecutive days per week. In addition to improving your cardiovascular fitness, this type of training helps you burn fat while you maintain muscle tissue. Alternate between short bursts of moderate and vigorous cardio. 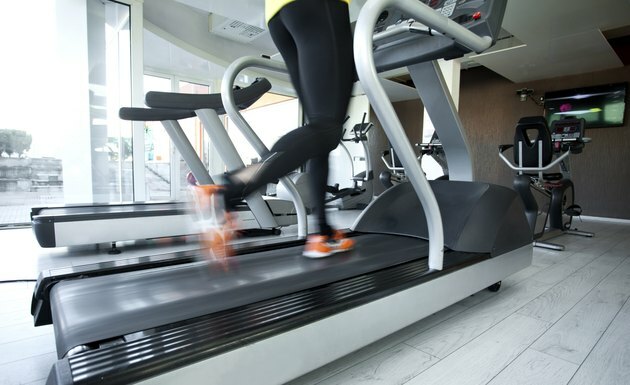 For instance, jog for two minutes before speeding up to a one-minute sprint, or ride a bike or pedal on an elliptical machine at an easy-to-maintain pace for two minutes, and then speed up to a vigorous intensity for one minute. Repeat the intervals about six times to finish your workout. When leg exercises become easy, challenge yourself by increasing the repetitions per set or by holding dumbbells in your hands. Eating a healthy, sensible diet is essential to your results, especially if you need to lose weight. Eating smaller portions and making healthier food choices can help you cut calories. Get nutrients from lean protein, reduced-fat dairy, fruits, veggies and whole grains. Consult your physician before taking on a leg-toning regimen, particularly if you suffer from an injury or health condition or have been inactive. 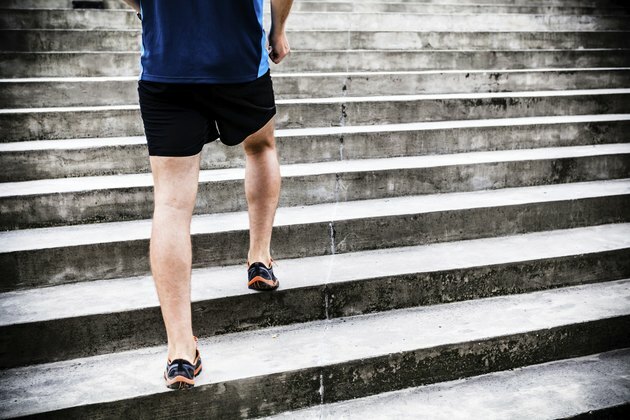 Are Step-Ups a Good Exercise?